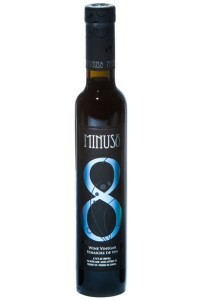 Minus 8 Vinegar is produced in limited quantities, cork sealed and hand dipped in wax in Canada. The name of the products relates to the temperature (-8 degrees C) at which the grapes are picked and then pressed to make ice wine. The low temperature is needed to develop the taste of this fine wine/vinegar. The weathering throughout the fall and winter give the grapes unmistakable flavors and the slow natural freezing concentrates the flavors of the juice. The grapes are immediately pressed at freezing temperatures to extract the most concentrated juice. The delicious, sweet wine is transformed into vinegar. The yield is very limited but the juice is rich, naturally sweet, rich, with hints of caramel, prune, plum, cooked sweet tree fruit; the finish is amazingly long and persistent. The Minus 8 Vinegar has a deep dark amber color. After opening a bottle of Minus 8, store it in the refrigerator to preserve flavors as long as possible. Otherwise, keep the cork in the bottle, and store it in a cool place out of direct light. I love Minus 8 vinegar and am glad to find it here. I'll be ordering some soon. It is rich in flavor. Sometimes I just like to sip it like wine.